Hello and welcome! I know it's only October but I just couldn't resist using some of my new Tim Holtz goodies. For those of you that don't know me, I've lived in Minnesota all my life. I'm a city girl but have spent many a days in the northern part of this gorgeous state. Today's card is a reflection of the times I've spent up north for this weeks challenge over on the Simon Says Stamp Monday Challenge Blog. Using stamps from the holiday drawings set I created the first layer of the globe from vellum. For the second layer I colored some manila cardstock with spray stain and then stamped the snowflakes from the christmas nostalgia set. The thin strip at the bottom of the globe was cut from silver deco sheets. For the base I used woodgrain cardstock that was colored with spray stain and ink. Next I added some foliage that I cut from kraft-core cardstock using the mini holiday greens die and topped it off with a number brad. 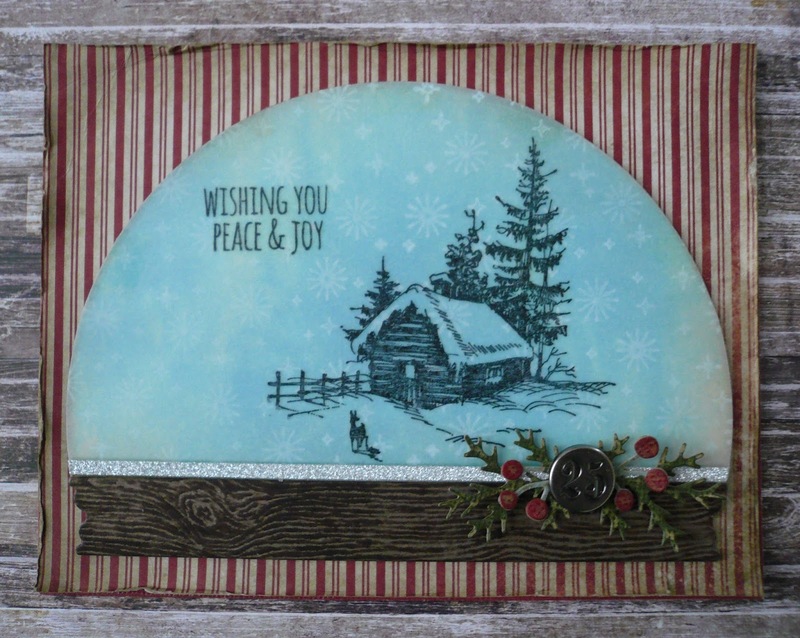 To finish I cut a piece of patterned paper from the tidings paper stash and attached everything to a A2 card. This is such an absolutely beautiful card! I love how clever you were to create a snow globe with such a quaint scene inside. And the striped background with the wood grain looks incredible! This evoked a lot of happy Christmas memories, so you nailed the nostalgia! 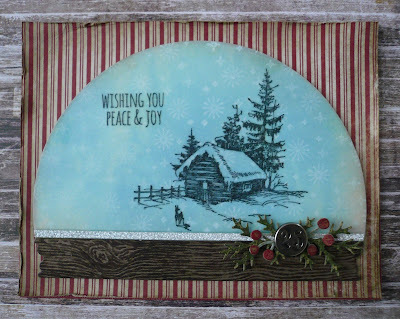 It's gorgeous and I'm so glad you shared such a lovely card with us for this week's Simon Says Stamp Monday Challenge!